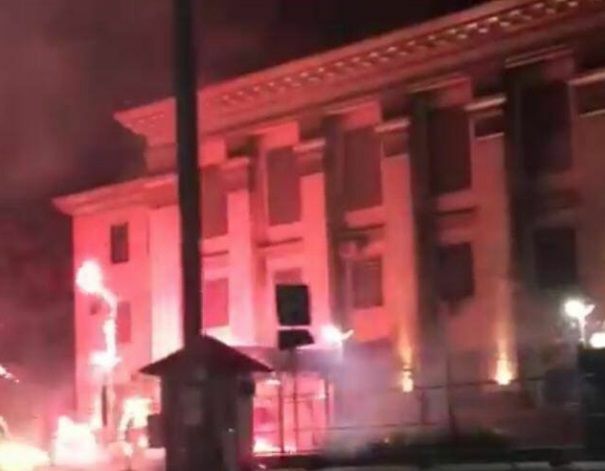 A group of unidentified persons threw fireworks at the building of the Russian embassy in Kyiv in the early hours of Saturday. A video showing the group "firing" at the embassy was published on Reuters Youtube channel. The video shows masked protesters holding a poster saying "Russian pigs, you are not welcome here. Today, it’s fireworks, tomorrow it’ll be ‘Grads’." Some 20 people can be seen outside the building, that including reporters and law enforcers. As UNIAN reported earlier the Russian diplomats are planning to open a polling station for the elections to the State Duma on Sunday, September 18, despite the ban imposed by the Ukrainian authorities on such a move. Read alsoUkraine's Ex-PM Yatsenyuk deems Russia's Duma to be unlawfully electedEarlier Ukraine’s Foreign Minister Pavlo Klimkin said that Ukraine may recall its delegation from PACE if the elections held in Crimea are recognized. Read alsoDuma elections in Crimea could trigger new wave of repression – human rights activistAs previously reported, on September 8, the Verkhovna Rada adopted a resolution which called on foreign parliaments not to recognize the elections to the State Duma in the Russia-occupied Crimea.